When you start planning your trip, consider where you want to stay. The Landtrasse district has amazing hotels, and, is right in the heart of the city, which means getting around either by foot, or subway, is going to be quite easy. Do some research as this area can be a bit pricey, but you may get lucky and find an amazing deal. Keep in mind, the rooms in historic hotels or apartments in Vienna are going to be much smaller than they are in the Western World, so pack accordingly. Depending on the time of year you are travelling, it can be rather warm, so pack light layers as down by the Danube can be much cooler than the city centre. Spring comes early in March with double-digit temperatures starting early in the month. The best time to visit is in April and May when the cherry-blossom trees are in full bloom, but it’s not yet overly warm during the day, and the sun ensures you can get around with just a light-sweater. The Vienna metro system is easy to use and maneuver, plus, you can buy a multi-day pass that allows you to hop on and hop off as required, so if you are planning to tour the city, this is a fantastic investment for your trip. You need to start your trip to Vienna with a bit of history of Mozart, a famous market and a trip to the opera! You can’t stop in Vienna without learning a bit of the history surrounding one of the world’s most famous composers, Wolfgang Amadeus Mozart. Born in 1756 in Salzburg (now Vienna), and was the youngest of seven children. he started creating his own music around the age of four. He started travelling with his family and siblings as a group of child-prodigies where they performed for royalty and heads of state. In 1781, Mozart performed his first Opera in Vienna, and the audience was sold. Now, you can visit the Mozarthaus Vienna, his residence from 1784-1787 and take in a piece of history yourself. This museum first opened it’s doors on the 150th anniversary of his death in 1941, since then, the public has been able to visit the last-surviving place he resided, and become part of history themselves. Located in the downtown core of Vienna, this museum is easily accessed by transit, or by foot. After you learn some history of the city, it’s time to take in the sights at the Naschmarkt, a market in the centre of the city. As one of the oldest markets in Europe, the Naschmarkt has definitely changed from it’s humble beginnings of being a place to mainly buy milk. These days, you can find fresh fruit and vegetables, meat, dairy and much more. It’s also a great place to get a bite to eat, some souvenirs and a refreshing drink. One of the first things you should do on your Vienna trip, is to immerse yourself directly into some of the architecture featured in the middle of the city, and check out St. Stephen’s Cathedral. Construction began in 1137 and the church was completed in 1160. The church’s impressive towers were added in 1368 to give the cathedral a grander appearance. The roof features a multi-colour, glazed tiles that feature the coat of arms of the City of Vienna. The cathedral is also steeped in history, featuring the weddings of many notable kings and heads of state, as well as the wedding (and later funeral) for Mozart. By visiting the cathedral, you can stand in the same place as impressive historical figures and become part of the history yourself. A quick walk (or subway ride) from the Cathedral stands the Hofburg Palace. This beautiful castle boasts impressive gardens and fountains on it’s grounds and is currently the residence of the Austrian President. Construction of the palace began in the 13th century, and wings were added to palace as needed. The surrounding gardens and grounds of the palace are just as impressive as the building itself, featuring fountains, trees and a variety of local flowers, these are some of the most beautiful gardens in Austria. Adults and children alike will enjoy walking through the gardens, and looking through the beautiful fountain at the view below. Your first evening in Vienna is the perfect time to take in an opera at the Opera House. Not only is the building beautiful, but you can take an an amazing show at the same time. Sleep well, as your second day in Vienna is going to be jam-packed so you don’t miss anything. Today, you’re going to take a bus tour, and a boat tour and finish your evening off with a romantic river cruise! Today, you’re going to start your day with a hop-on, hop-off bus tour. These tours allow you to see many sights in the city, and experience a lot, in quite a short amount of time. Use your tour to see the museum district, the Heroes Square, City Hall and more. The best part of hop-on, hop-off tours is that you can get off at any stop and visit it up close, and then get back on for the next ride. This monument to heroes in the heart of Vienna was erected in 1871 and construction ended in 1881. It sits right in the centre of the Hofburg Palace and was the home of the much-controversial announcement made by Adolf Hitler of the Austrian Anschluss to Nazi Germany on 15 March 1938. Take a few minutes to stand in this spot in history and see the statues that surround you, while remembering how far we have come since those days. While you’re on the hop-on tour, you’re going to stop in the Museum District, or Museumsquartier (MQ), which houses some of Vienna’s museums. Stop in and visit the Leopold Museum, which was built in 2001 and has been creating controversies ever since due to the rather large painting of naked rugby players that graces it’s exterior walls. Then done at the Leopold, consider visiting the MUMOK (Museum of Modern Art Ludwig Foundation Vienna) which contains a good collection of modern and contemporary art. This grey- cylindrical building doesn’t look like much from outside, but what it has within its walls will leave you speechless. After you’ve had your fill of museums, it’s time to see the Parliament buildings where the two houses of Vienna Parliament conduct their business. Opening in 1883, with classical-greek architecture, the building is beautiful to look at as are the grounds outside with the sculptures and fountains, so take some time to tour the outside and have a look around. This building is considered a UNESCO World Heritage Site, so it should not be missed. Once you’ve visited the outside, you can then take a tour of the interior, which is now open to visitors. Depending on which bus tour you booked, you may be treated to a cruise along the Danube river. This river runs throughout Central and Eastern Europe, and connects several countries including Germany, Hungary, Romania and more. Taking a dinner cruise is an amazing way to see the city lit up and night and experience something the locals get to see each day. Relax while you are wined and dined and then spend the evening dancing, while gliding along the water with the city-scape beside you. After your cruise, it’s time to head back to your hotel, as tomorrow will be another busy day. Since yesterday was a relaxing day of taking the bus, and cruising, today is for visiting a palace, a zoo, and an amusement park! Schönbrunn Palace is an impressive castle in the heart of the city, it features 1,441 rooms, impressive gardens, a zoo, and a Strudel shop. For years now, the castle has been a huge tourist destination, such so, that if you want a peek inside, you’ll have to be early (or book online ahead of time). This palace and the surrounding grounds is so large, that you can easily spend most of the day here. The palace was erected in 1548 for the Habsburg Empire and features impressive gardens and fountains. Also found in the garden is the Gloriette, which offers an impressive view of the grounds, the castle, and the surrounding city. Take a coffee in the little cafe here and spend some time taking in all the views that surround you. Once you’ve refuelled, you’ll notice the Vienna Zoo, or, Tiergarten Schönbrunn, is located on the grounds of the castle and is one of the oldest zoos in the world, so definitely worth a visit. You can spend a few hours enjoying the serene landscapes of this zoo, which specializes in the conservation of species. This zoo is one of only a few in the world to house the giant panda, and has since welcomed panda-cub twins. After a few hours in the zoo, you can then take some time to visit the Palmenhaus Schönbrunn, or Greenhouse, which houses a variety of flora from around the globe and is one of the largest botanical exhibits in the world. After all that walking, you should definitely take a break at the Strudel shop. You can try the traditional pastry as well as learn how it is made, and the history behind it. Vienna is full of UNESCO sites, and the castle is one of them. Whether you do the interior tour or not, simply visiting the grounds is worth it. Once you’ve toured the castle, it’s time for some excitement, you’re going to hop on a metro bus and go a few stops to Prater Park, home of the giant Vienna Ferris Wheel. The park has plenty of attractions which leaves something for everyone. From the ferris wheel, to a wax museum, you’ll be able to get the full Viennese experience in just a few hours. Plus, there is no better place to try some Viennese street food, than at an amusement park. Try a bit of everything, after-all, you’re on vacation. After you’ve had your fill of the amusement park, get your dancing shoes out, as you’re going to see the a bit of the night-life! Depending on your tastes, you can find Jazz clubs, to dance clubs and even Irish Pubs. Take a cab though in the evening, as getting around a night can be a bit tricky. Your last day in Vienna is a chance to have fun, visiting horses, dinosaurs and seeing the city from the top of a tower. Now, you can’t stop in Vienna without seeing the famous Lippizan horses. Not an ideal destination for anyone with a horse allergy, but, either way, it’s a once-in-a-lifetime chance to experience some of the training sessions, or, if you are lucky enough, one of their amazing shows! Established in 1729, the school has been wowing spectators for centuries with the beautiful, white horses they are known for. For a moderate fee, the school also offers a behind-the-scenes tour where you can meet a horse. The Natural History Museum opened it’s doors in 1889 and originally housed the Habsburg collection. These days, it houses fossils of a different kind, dinosaurs. They also have the largest collection of meteorites in the world within the museum walls. The building itself is a piece of beauty, featuring ornate architecture and decor, the museum itself could be considered an artifact as well. Another person Vienna is famous for is Freud, which covers the famous psychologist’s life story. The museum is housed in Freud’s former apartment, and opened to the public in 1971. You can learn about the man himself, his practice and the effect he had on modern psychiatry. Your last stop of the day is the Danube Tower, at 450Ft above ground level, this tower gives you an impressive 360 degree view of the city. Take in the sights from the observation decks, or grab a coffee and relax in one of the two revolving restaurants for a really interesting look at the history and architecture of this beautiful city. Your last evening in this magnificent city should come with an amazing meal of traditional food. Wiener schnitzel served with dumplings will leave you full for your long trek home! 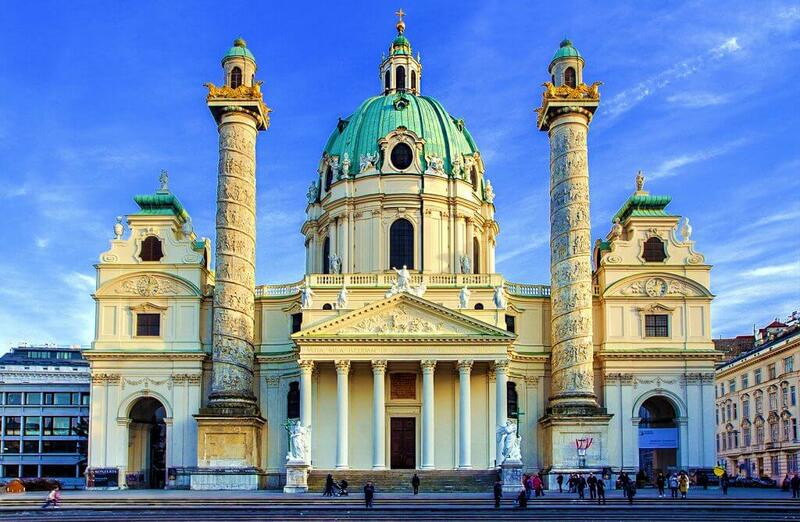 Vienna is a beautiful city, full of amazing architecture and people. With all this beauty, comes a cost. As a European capital city with such history, tourist attractions seem to cost a little extra here. One way to help cut your costs is by purchasing a Vienna City Pass. This gives you free access to plenty of the attractions in this guide, as well as the bus tour. By purchasing your city pass ahead of time, you’ll be able to stretch your dollar a lot further to buy more souvenirs, or spend it on delish food and wine. With the city-card, you can also purchase a travel pass that will allow you to easily travel to all the attractions in and around the city without worrying about having exact change for the buses. Vienna is a magical city, with rich history, wonderful people and amazing food. If you only have four days to spend there, use this guide to make yourself an itinerary to ensure you do not miss anything. From the castles, to the historical figures that once walked the same streets you are walking today, there is so much to learn, see and do that you will need to come back again and again to experience everything.